Grey Sparrow’s Summer Issue now complete and ready to be read! “Cutting Wire” by Grey Sparrow’s 2013 Summer Issue guest photographer Tracie Van Auken. The Summer Issue of Grey Sparrow is finally done and can be found here. This issue features work by Pulitzer Prize-winning poet and United States Poet Laureate Natasha Trethewey and photography by guest photographer Tracie Van Auken, as well as work of fiction and poetry by new and established writers. Take a look today and learn something new about the world! How do you force yourself to write when writing is the last thing you want to do? Every writer knows that there is a love-hate relationship between the author and the act of writing. When everything is well with the world, the words flow freely: the author not only wants to write, but also has the time, energy, and ability to make it happen. In case you aren’t aware, though, let me let you in on a little secret: things are rarely well with the world, especially the world of the writer. All too often, different aspects of life converge in such a way as to conspire against the writer who is trying to write. After all, for most of us anyway, writing does not pay the bills. That may be what we are working towards, but it is usually not the case. And when writing doesn’t pay the bills, it can be difficult to justify spending your time working on a new story or poem or essay when you could actually be paying the bills. And when you finally are done paying the bills, family and friends demand their fair share of your time and energy. At the end of the day, do you really want to get started on that new project, or do you want to go to bed? More often than not, I want to go to bed. The simple truth is that writing is work — it is a job like any other job (whether a first, second, third, or fourth job it doesn’t matter). If you ever want to get anything done, you need to get things done. But how do you actually force yourself to get things done? My methods have varied over the years, but I recently found some strategies that Gina Barreca, author of the best-selling They used to Call Me Snow White, But I Drifted (and preface writer to my book Chronicles of a Bee Whisperer), uses to force herself into the groove: emotional blackmail and guilt. “Some writing is its own reward: I have permission to write this post only because I finished the three letters of recommendations which have been staring up at me with their big, sad eyes every morning as I approach my desk. The letters and their neatly addressed envelopes been eying me like stray kittens: ‘Please! We’re orphans! Help!’ I sent them all to good homes and that means I can now play with my own work. ‘How does the guilt and emotional blackmail part work?’ asked one aspiring writer during the book-signing part of Saturday’s events. She liked the bribes idea, but was worried that I might have sent myself to bed without dinner. Or a beverage. Assuring her that deprivation of food was never permitted in my household, I explained that the emotional blackmail I wielded was a dangerous weapon. It was something best done by professionals in a closed setting and probably should be used by amateurs only in a controlled situation. Emotional blackmail as a tool for writing should be saved for those moments when nothing else works. I know these strategies work because I’ve used them before — as someone raised in a Roman Catholic household, guilt is especially useful in getting me to do things. And emotional blackmail? My mother had that bit down pat by the time I was four. I was raised by these methods, molded by them…if anything can get me to sit down and write, its this. It may be just what the doctor ordered to get your writing back on track! You can view Barreca’s full post here. How do you deal with writer’s block? How do you force yourself to write when it’s really the last thing you want to do? Though the deadlines for the fist three issues have already passed, poets can still submit to the “Work and Play” issue until September 1st — up to five previously unpublished poems per submission. I’m also thrilled to say that I just found out that two of my newer poems have been accepted for the issue focused on “The Living and the Dead,” tentatively scheduled for October 2013! The first — “She sometimes dreams” — I wrote while a student at UConn, under the tutelage of Darcie Dennigan (with some fine tuning by Penelope Pelizzon), and the second — “Poltergeist” — I wrote during a particularly boring shift stocking produce at my local Adams Hometown Market (which just goes to show you that zucchini can serve as both a tasty side dish and poetic inspiration all at the same time). Sorry I didn’t get this call out to you all earlier, but if you’ve got any poetry that meshes with “Work and Play” (however loosely) get out there and submit today! 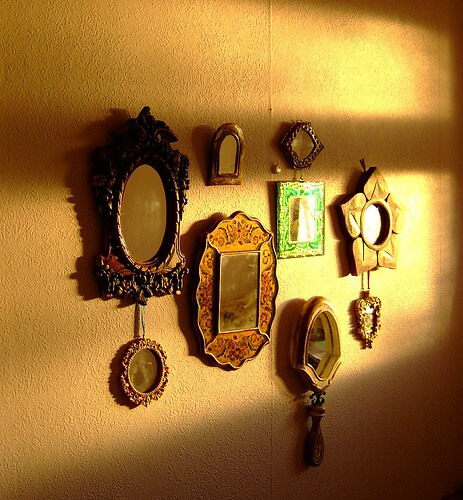 “Mirrors” by Mark Santa Ana/Flickr. Playing off of the word vanity, of course. The promise of publication is one of the most enticing promises to an aspiring author (beaten only, perhaps, by the promise of fame and riches). But the promise of publication can also be one of the most dangerous promises for an author to stumble upon — a verifiable sirens call — because it is ofttimes a promise offered by the prostitutes of the publishing world: or, as the rest of the world calls them, vanity presses. A vanity press is a press that preys upon the author struggling to make his dream of being published a reality. Vanity presses usually present themselves as a company that would like to help you make your dreams come true: they tell you that they see merit in your work, that you deserve to be published, and that they can make that happen. There is a catch, though: they can’t do it for free. While they can come in a variety of forms, there are two common business models behind these presses. The first deals with single-author books: the author must pay for the entire editing process — editing, printing, distributing, marketing, and any of a slew of other “services” that they claim to offer. This is the primary way that the press will make their money — not by selling your book to any audience, but by selling you their services. The second model involves anthologies of multiple authors, where there is usually no charge for editing and printing. This model almost seems legitimate, until you realize that the primary way that the press makes money off of these books is by selling copies of them to the authors themselves (or, as an added profit, to the friends and families of the authors) at an extremely marked up price. Hence, the term vanity press: they are presses that cash in on the vanity of aspiring authors who just want to see their names in print, and who will gladly jump at the opportunity, even if it involves shelling out cold hard cash for a book that they will never see any profits from. But the worst part of it is, in my mind, that these presses will publish anything. In the case of an anthology, you can find some pretty decent poetry paired up with poetry reminiscent of the limericks scrawled on the bathroom stall at the local A&P. That is, perhaps, the biggest ego crusher the unsuspecting author who is thrilled with his first publication will face when he receives his $30 copy — while his work might have been good enough to place in an actual publication, he finds it next to poetry that looks and sounds like something a cat threw up. Believe me, I know the feeling. My first publication was at the hands of a vanity press. Under the premise of “scouring the internet for the best new online poetry,” this particular press told me that they wanted to publish one of my poems that I had posted on a poetry forum. As a twelve year old, I was thrilled, and I gladly signed the contract and ordered two copies (one for my grandmother, of course). And when my copy arrived only a month later, I was virtually ecstatic — they chose my poem to be the first poem in the book. My poem was the introduction to a wonderful literary endeavor. And then I found out that my uncle had also had a poem accepted for the same book, and when I flipped through his pages I was dismayed to find that his poem opened the book, and that mine was actually nowhere to be found. That was when I realized that I had been gypped. It was a crushing blow that left me unable to send any of my work out for years (which is actually fine by me, because the angst-ridden poetry from my tween years was — I do not exaggerate — god-awful). But I do have to say that I’m (sort of) thankful for the experience, because it has made me a more careful writer. Because of my experience with a vanity press, I now don’t send anything out as a submission to a press that looks anything other than professional. I no longer let my eagerness to have work published overwhelm my own sense of common sense. I do want to say, as a quick aside, that for some people a vanity press is a perfectly legitimate business endeavor. If you truly only want to be able to say that you have had a book published, and don’t mind the fact that you will never receive any money or real gratification from the endeavor, then by all means go for it. For some, that’s enough. Most writers, though, would benefit from some quick rules that help them differentiate a vanity press from the more legitimate presses. They Charge a Fee: A vanity press will generally require the author to pay for the cost of reading, editing, and producing the book, and will then charge exorbitant prices for copies of it. Lack of Scrutiny: A vanity press will publish truly anything. They’ll gladly publish the novel that you slaved over for years, that is actually almost ready to be published by a bigger name publisher, and in the same fell swoop publish a photobook of various piles of dog feces. Lack of Profit: As you are the press’s primary source of income, you can pretty much say goodbye to any thoughts of receiving an advance or royalties for your book. If the press does sell to people apart from you, they’re generally going to keep any of that extra profit for themselves. 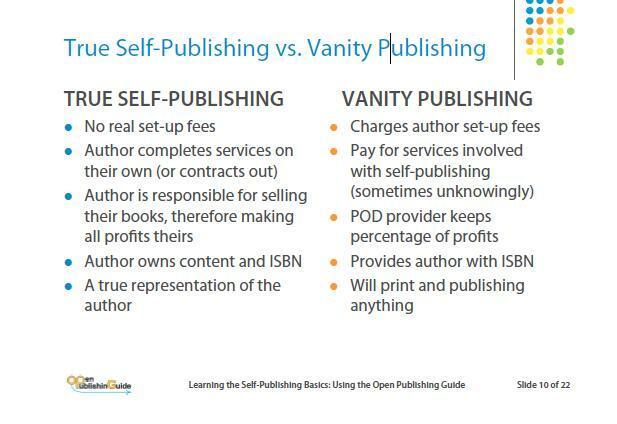 I do want to draw some distinctions between vanity presses and do it yourself publishing, though, because they can be very similar. While DIY publishing is completely paid for by the author, the author also keeps all of the profits (apart from printing costs). And while some DIY publishing projects have been astronomically horrendous, there have actually been a good number of very successful books published and printed entirely by the authors — no publishing house involved. While DIY publishing isn’t for everyone, it is a viable option, and it is certainly a better choice than a vanity press if an author ever wants to potential to earn profits from their work. What about you? Have you ever had any experience with a vanity press? Have you ever been swayed to sign away your rights and the potential of future profit just to have something published in your name? How did you recover from the blow of knowing that you were duped (or have you yet to recover)? Eunoia Review is a great online literary magazine that recently accepted a few poems from my book Chronicles of a Bee Whisperer, so I thought I’d pass along some of their submissions info! The journal takes its name from a Greek word meaning “beautiful thinking,” and as such, it aims to share the fruits that come with beautiful thought. Publishing one to two pieces of writing on a daily basis, you’ll always be sure to find something new and exciting when you click through their pages. Poetry: submit up to 10 poems in a single attachment. Fiction: submit up to 15 000 words in total (single or multiple pieces). Creative non-fiction: submit up to 15 000 words in total (single or multiple pieces). Send in the body of an e-mail as plain text or attached as a Word document to eunoiareview[at]gmail[dot]com. Include a short third-person biographical note. Subject line of the e-mail should read Submission: [Genre] – [Writer’s Name]. In the case of reprints, you must retain or have regained the rights to your work. Please indicate which pieces in your submission are reprints, as well as stating their publication history. Be sure to check them out! As a lit-mag willing to publish reprints, they can be a great resource to authors trying to spread the word about their books. The poems from my book will be published in mid-July — I’ll post more details as they become available! With three print editions a year, there are a lot of opportunities to find some great writing that falls into the broad theme of “Jewish life”. And, with so many editions, it becomes easier to submit — you don’t need to wait for a one-month period that comes just once a year. You can find Poetica‘s guidelines here. Only previously published works will be considered. Works previously published in Poetica will not be considered. list the name of publication, edition, year published. please include a statement with the submission. And submitting to the Holocaust Edition does, unfortunately, have a price — $10 per submission. I’m usually a big hater of publications that require a reading fee for submissions, but for this one I think I’ll break my own policy and send something along — there are a few pieces from my book, Chronicles of a Bee Whisperer, that might place nicely in the edition. I hope you’ll take a look at the journal, consider submitting, and pick up a copy today! Yale University has requested an annual subscription of Grey Sparrow! I know this might not sound like a big deal, but Yale University has requested an annual subscription of Grey Sparrow! Believe me when I say that this is tremendously great news for a small literary magazine — when Yale notices you, you know you’ve made it big. Grey Sparrow is a literary journal published by Grey Sparrow Press, which was established by Diane Smith in 2009. Since its inception, Grey Sparrow Press has published both online and print editions, with a current policy of publishing one annual print edition that aggregates the best submissions from the entire year. In addition to this, Grey Sparrow Press has spawned a separate press — River Otter Press — for its book publications, which include Bones Buried in the Dirt by David S. Atkinson; The Northwoods Hymnal by Luke Hawley; and my own book, Chronicles of a Bee Whisperer, which was actually River Otter’s first publication. Both presses are open for submissions on a rolling basis, so if you’ve got anything to submit, you can do so anytime! River Otter Press accepts single-author books of poetry and fiction, and Grey Sparrow Press accepts everything from poetry to fiction to creative nonfiction to flash. Take a look today! I really can’t convey how thrilled I am to be a part of such an amazing pair of presses as this! Congrats, Grey Sparrow, for your ivy-league subscription!